Have you eaten breakfast this morning or do you belong to the breakfast-skippers group? No nutritionist or doctor will tell you to miss your breakfast unless absolutely required. Yet, many people do so. Especially the "nonmorning" people who probably would like to avoid that time of the day and everything that comes with it, including breakfast. Although all three traditional meals are important for supplying the daily nutrients, nutritionists give a lot of importance to breakfast which is the foundation of healthy eating habits. Several studies have been conducted on breakfast and they all conclude the same breakfast is important. Lack of time, not hungry in the morning, bored with breakfast items, trying to lose weight, no one to prepare it, combining breakfast and lunch into brunch works better. Skipping breakfast may hinder the growth of children because the body will be forced to use its protein stores to meet its energy requirements in the morning. A study of breakfast eating patterns conducted in Delhi has been published in the recent newsletter of CRNSS. This study conducted on 220 school children revealed that only 50 per cent of the children ate breakfast regularly every day. Those who skipped breakfast had a much lower nutrient intake for obvious reasons. Growth of the children who ate breakfast was better than that of the children who skipped breakfast. Children who ate breakfast were also ahead of those who didn't eat breakfast, with respect to class attendance, test performance and participation in extra-curricular activities. Why is breakfast important? Studies have shown that eating breakfast is associated with improved strength and endurance in the late morning, along with a better attitude towards work. The brain has no reserves of glucose, which is its main energy source. This energy has to be constantly replenished for the brain to function well. Breakfast helps to replenish the blood glucose levels after a night's empty stomach. Several research studies have shown that eating breakfast has advantageous effects on late morning mood, satiety and cognitive performance. In one study, where reasoning, inference and problem solving abilities were measured, it was found that eating breakfast was beneficial and skipping breakfast consistently caused hunger and led to performance difficulties on tasks requiring concentration. This study also showed that a balanced breakfast is more effective in suppressing hunger than an unbalanced one. An unbalanced breakfast suppressed hunger only for a short while. Breakfast is the last meal one should skip in a weight-loss programme. 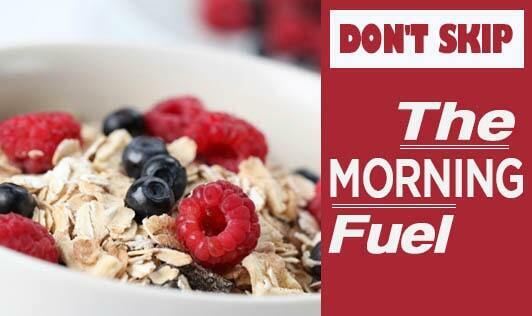 The body burns energy efficiently in the morning and therefore, weight does not increase by eating a good breakfast. A small breakfast or no-breakfast and a large dinner are weight watchers' enemies. On the other hand, a large breakfast and a small dinner keep the appetite up in the morning. • Breaks the night-long fast. • Supplies energy when the body needs it most. • Controls the urge to snack. • Prevents irritability, lethargy and fatigue. • Helps to stabilise blood sugar levels. • Provides about one-third of the day's nutritional requirements. • Helps to control weight by promoting regular meals. • Use milk, curd or buttermilk without cream. • Oil, butter or ghee intake should be minimal or can be avoided completely. • Sweets and sugary items should be avoided. • Avoid refined foods made from maida and use whole wheat foods instead. • Don't drink caffeinated beverages. • Include lots of fruits. • Stick to natural foods as far as possible and keep away from foods with too much additives. Your body and brain need their morning fuel. Don't deprive them by being a `only coffee and a i smoke for breakfast' person.